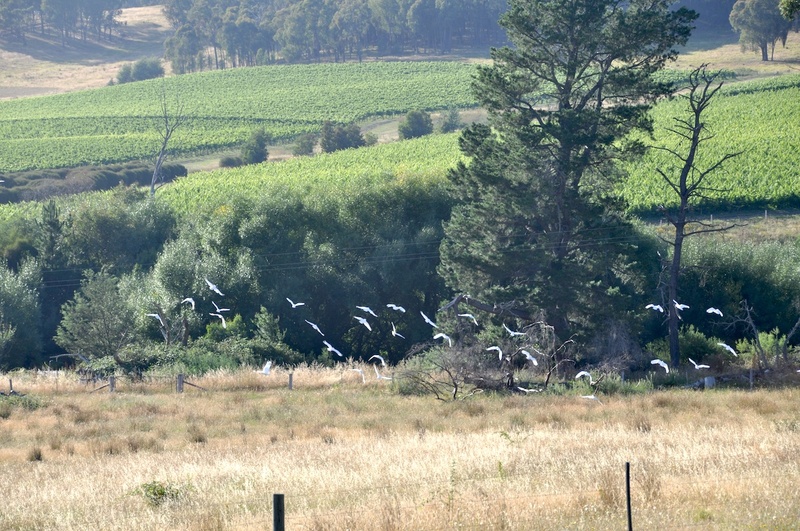 A view from Casa Luna: cockatoos flying by a vineyard. One of the wines we had with dinner probably came from this paddock. And so… to continue our tale of our New Year’s excursion. Our package at Casa Luna included breakfasts and dinners, as well as what was described as “a long and languorous candlelit degustation dinner of our Italian-influenced food, with every course matched to King Valley and Italian wines – starting at 8.00 pm and finishing late.” So at 8 pm on December 31, we went to the Casa Luna dining room where we met, for the first time, our fellow resort guests, along with 2 couples from another nearby accommodation that doesn’t serve dinner. After some prosecco, canapes and chat, we sat down to a wonderful 4 course dinner. Gwenda, one of the owners, is a former caterer and an aficionado of Italian food; the public areas at Casa Luna are lined with Italian cookbooks and, of course, her cuisine goes perfectly in the King Valley. First up was a prawn salad (veggie version for Lisa), paired with Dal Zotto arneis; next was quail with another Dal Zotto white (a blend of 4 grapes), followed by duck breast with chestnut sauce, paired with two wines – a local (literally, next door!) barbera and an Italian barbera. Dessert was an amaretto cream with cherries and a berry wine. Our building at Casa Luna was easy to find in daylight, but the walk back after NYE dinner was a bit of a challenge. Just as dessert was being served, someone noted that it was 11:55, so Dave (the other owner) turned on the radio, we heard the countdown and fireworks from Sydney, then everyone went back to their food. A dozen people in the building (two owners and 10 guests) and no one really cared about NYE! We finished our food and everyone staggered off across the dark property trying to find our cabins, and marveling at the bright sky. We don’t remember the last time we saw the Milky Way! Other guests took the time to name the stars (they call the “big dipper” the “big saucepan” here) and then we called it a night. The road that Dan couldn't resist at 6:45 am on New Year's Day. It was less appealing on his return trip at 8:00 am, because the hill going up to Casa Luna is long. On the morning of the first day of 2012, Dan woke up around 5:45 and looked out at a beautiful sunrise. 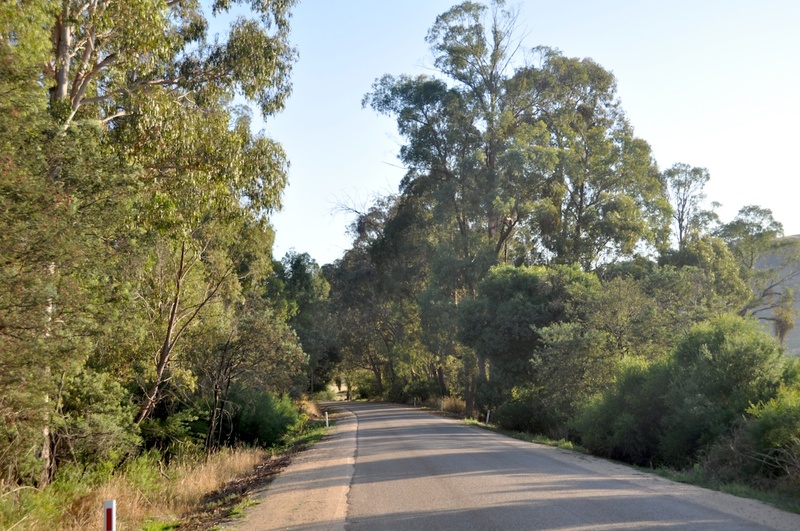 He went back to bed, and lay there for an hour pondering his bicycle, 20 degrees, sun, the prospect of parrots and kangaroos being out at that hour, and the probability that there would be no cars on the road. All this was weighed against only 5 hours sleep and a lot of wine the night before. But, after an hour of anguished deliberation, he got up, got dressed, and hit the pavement for a 40 km round trip from Myrrhee to Moyhu. And yes, there were parrots (hundreds! ), a couple of kangaroos, and a masked owl (another first). And no traffic except one other idiotic cyclist who he met going both ways. He got back to the resort just as Lisa was emerging from the shower, glad he hadn’t woken her earlier. After a light continental breakfast, we toddled off to Milawa again to do a bit more exploring – this time to visit the cheese factory. We can buy Milawa cheese here in Wagga, but were unaware of the full range, which is pretty spectacular. Soft, semi-soft, hard, goat, cow…they probably make (and let you sample) 20 different cheeses! We stopped in again on the way home, the next day, to purchase a few of our favourites. All is quiet on New Year's Day at Lake William Hovell. Casa Luna also prepared a picnic lunch for us on 1 January, and so we decided to take in some scenery. Lake William Hovell is up in the mountains at the south end of King Valley, and the source of the King River that gives the valley its name. It is a nice little lake, made larger by a dam, and set in a bush at the end of a long and twisty road. Since it was a long weekend and about 38 degrees, it was pretty busy with families swimming, fishing, and just generally kicking back and enjoying the sunshine. We had our picnic in the shade of an evergreen tree that was home to a pair of fairy wrens who entertained us while we ate. The entrance to the Pizzini cellar door is a bit strange, but 40 metres through this wine shed, there is a beautiful modern tasting room. Then, back down the mountain for…you guessed it…more wineries. 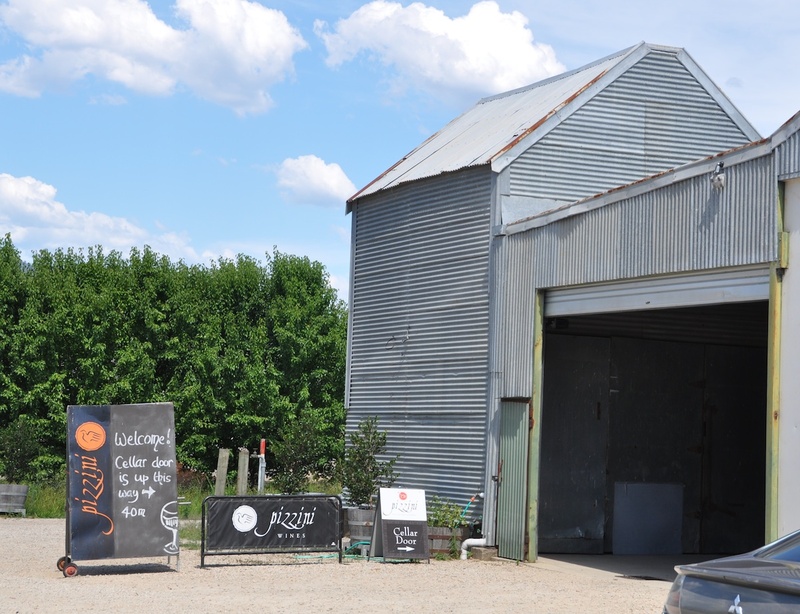 We skipped Chrismont – it looked nice, but we had actually tried many of their offerings at their outlet in Milawa – and we skipped a few others too (sad when there are so many wineries you have to be selective, isn’t it??). We did stop at Politini, which is fairly small; the old guy at the cellar door (if you look on the website, you’ll see a pic of him playing the accordion!) told us all about how he started it and all about how he is the grower and his son is the winemaker. Then off to Pizzini, which is much larger and more elaborate, but still a small family operation in the overall scheme of things. Both offered up some good wine, and if not for having to drive, we could have checked out the other dozen or so producers in the neighbourhood. The site of an amazing meal at Casa Luna, and inspiration for us when we finally get our own house. At the Casa that night, we had a great pizza party! 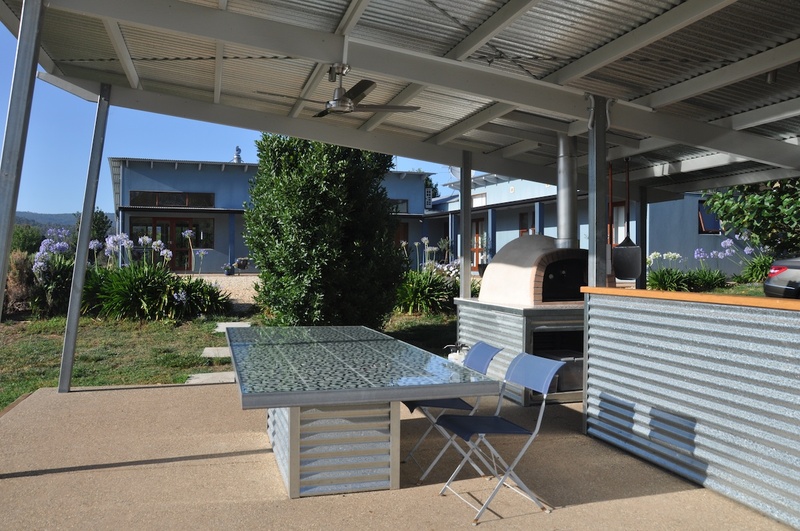 Casa Luna has an outdoor dining area with a wood-fired pizza oven (actually common here…all the other guests that night had one in their backyard too…we can’t wait to buy a house!) and Gwenda had prepared crusts and toppings and we all sat around and drank and made our own pizzas (Lisa had salami, olives, basil and cheese and Dan had basil, olive, anchovy, cheese, and potato). There was some conversation about how Italians use pizza as a first course, but even during this conversation, no one really mentally prepared themselves for what came next. After all the pizzas were finished, Dave took the coals from the oven, put them into the built-in barbecue, and then grilled some sausages (made from their own cows!) and lamb chops. And the wine-fueled feast continued until around midnight…at least everyone was smart enough to leave their porch lights on that night, which reduced the stumbling in the dark. Sadly, the next day brought us back to reality. Breakfast, load up the car (bikes on roof, about 4 cases of wine in the boot), and back to Wagga. We made a detour to Rutherglen for a pie at Parkers Pies (maybe the best pies we’ve had, and we’ve been sampling a lot) because with January 1 being on a Sunday, the 2nd was still a holiday and everything between Milawa and Wagga was closed. It was starting to get hot down in Victoria. Really really hot. When we were in Rutherglen, it was 39; the next day it got up to 40. Wagga was about 4 degrees cooler. And we were too wined out by then, so we actually made it through Rutherglen without stopping at any wineries! 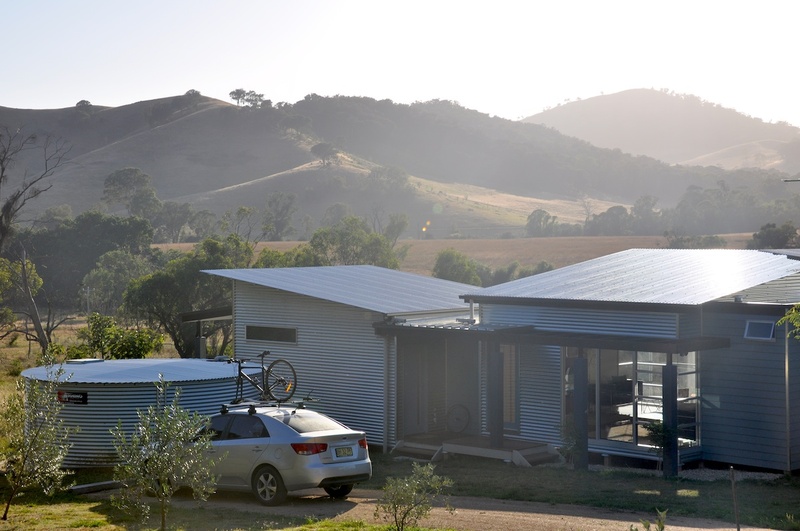 This entry was posted in cycling, food, holidays, King Valley, mountains, New Year's Eve, wine, wineries and tagged king valley, wine. Bookmark the permalink.